Anson Jones was born in Massachusetts in 1798. He studied medicine and began a medical practice in Philadelphia in 1826. Jones came to Texas in 1833 and during the struggle for independence entered the army as a private soldier. 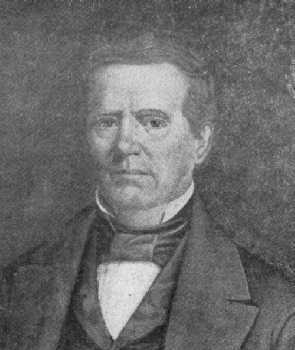 Following the revolution, Jones was elected to the second Congress of Texas in 1837, and the following year was appointed Texas' minister to the United States. After his return, he was elected Senator from Brazoria County, and became Secretary of State during Houston's second administration. In 1844, Jones was elected president of the Republic of Texas. He held this position until Texas' annexation, when he surrendered the executive office to Governor Henderson, who had been elected the first Governor of the State of Texas. Because of he was conspicuously neutral on the issue of annexation to the United States when the general mood on the public was strongly for Texas statehood, Jones quickly lost influence as president of the Republic. After statehood was achieved and Jones failed to re-establish himself in public office, he became increasingly moody and introspective. He took his own life on 9 January 1858, and is buried at Glenwood Cemetery in Houston.